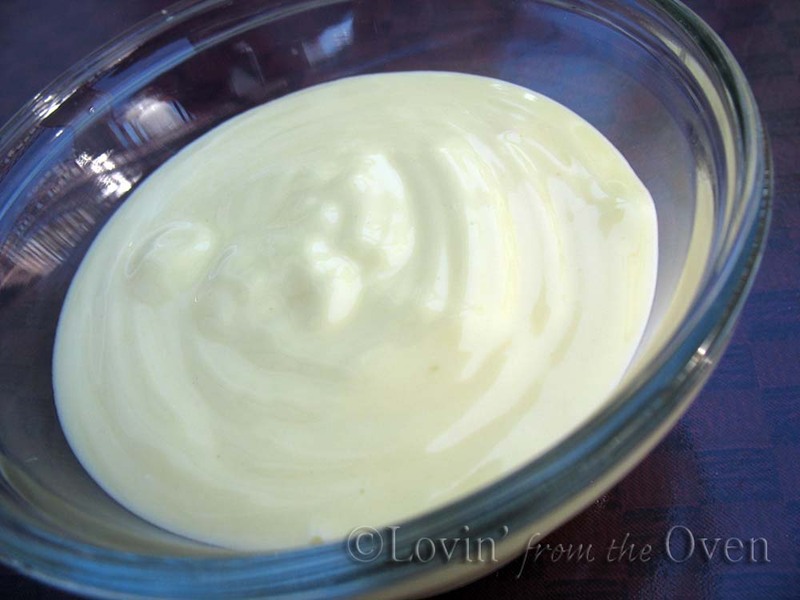 When a family member of mine was restricted to a no-salt diet, I decided to try making my own mayonnaise. Why? Because I used a blender and olive oil. As I was pouring the olive oil slowly through the blender, it began to spray everywhere! There was no escaping the splatter, so I stopped everything and poured the contents to my food processor. It thickened up nicely, and then I tasted it. YUCK! It had such a bitter aftertaste! After some research, I discovered that the heat from the metal blade of my processor and contact with the olive oil may have contributed to the funky after taste. 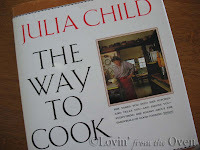 Then my father in law gave me this book ~ My first recipe from it is going to be mayonnaise! 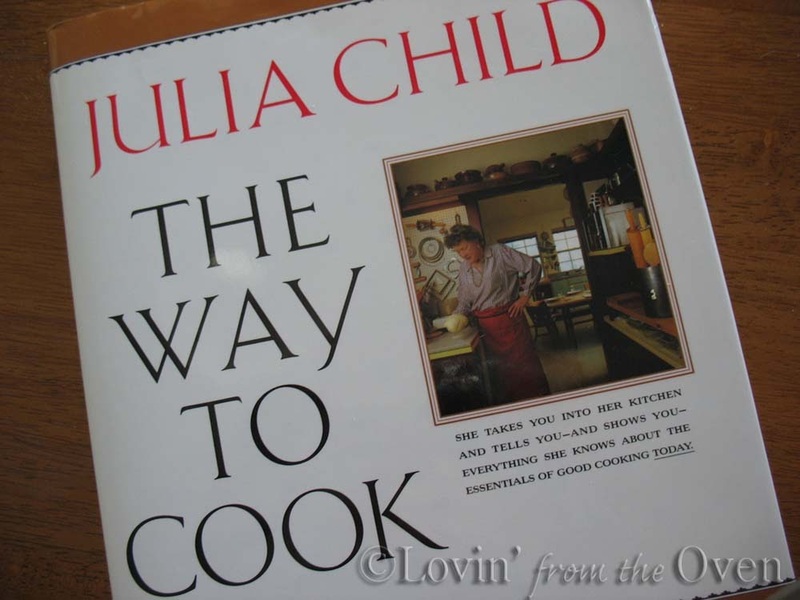 You can't go wrong with Julia, right? 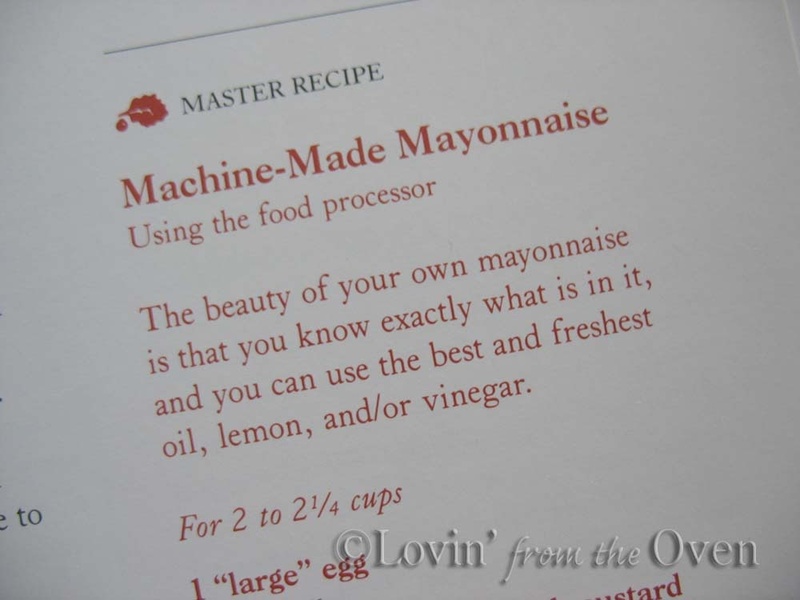 "The beauty of your own mayonnaise is that you know exactly what is in it, and you can use the best and freshest oil, lemon, and/or vinegar." Look at the list of ingredients of your favorite mayo. Do you know what calcium disodium EDTA is? Click on the link if you really want to know. Store bought mayo also has sugar in it. This recipe doesn't! Mayo begins with fresh room temperature eggs and egg yolks. No need to buy a fancy egg separater...crack and egg as shown HERE and transfer the yolk back and forth from shell to shell, allowing the whites to fall into another container. 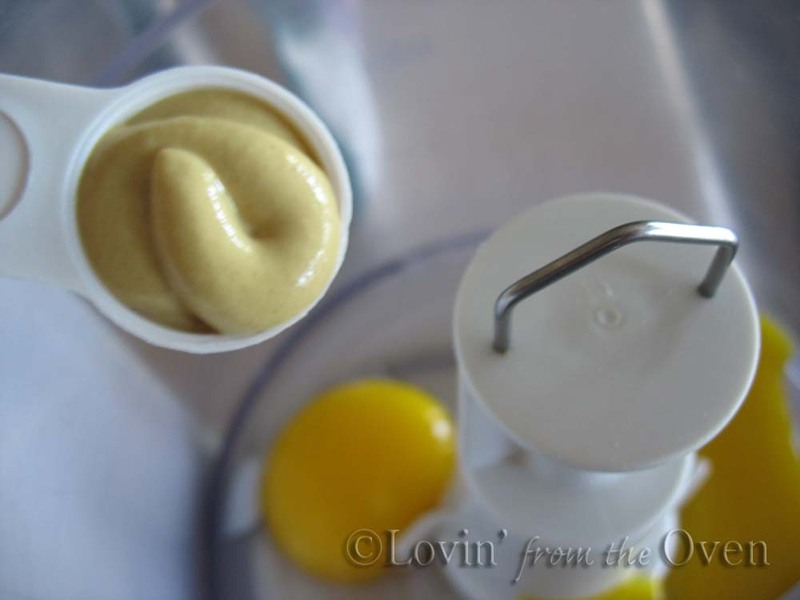 Julia's recipe calls for Dijon prepared mustard. Feel free to use any mustard you like! Process for 30 seconds. 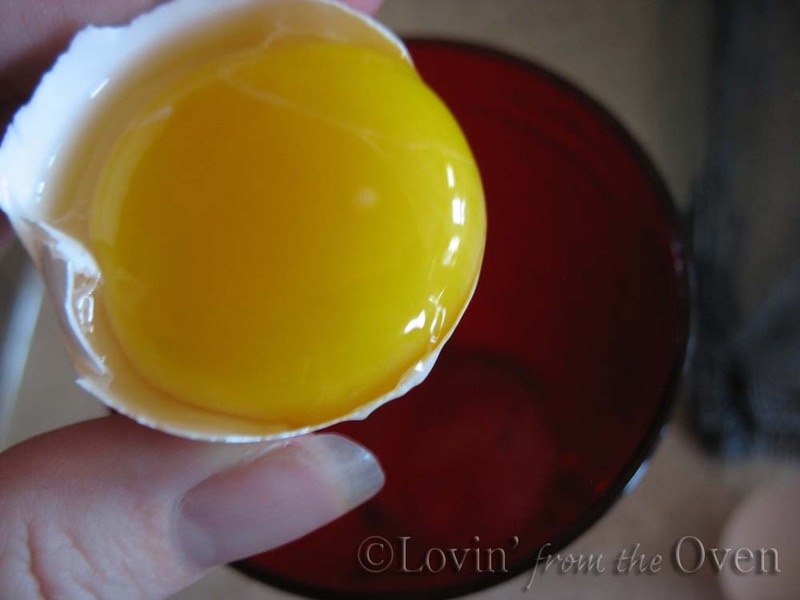 Look for the yolks to get thick and syrupy. and process for 7 or 8 seconds. Pour the oil (I used Canola) veerrrrryyy slowly through the processor chute while the machine is on. It helps to have the spout right on the lip of the chute...otherwise oil will drip down the side of the cup. 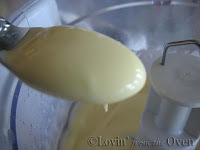 After dribbling in about 1/4 c. of the oil, check for thickening. It was thickening, but not as thick as it should be. Within minutes, I had a light, creamy homemade mayonnaise that tasted SO GOOD! I've always wanted to try my hand at making my own mayo but I'm so used to the convenience of the jarred stuff. I'm going to consider making my own the next time I have a recipe that calls for it. Frieda, I failed the first time I tried to make mayo. You've encouraged me to try again. I shall let you know. I love your tips! Okay I'm impressed. 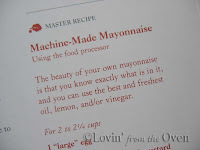 Homemade mayo is one thing I'm not willing to make. I hate eggs. I hate the taste of eggs and I'm scared homemade mayo will taste eggy. Kudos to you though as I am very very impressed and jealous. 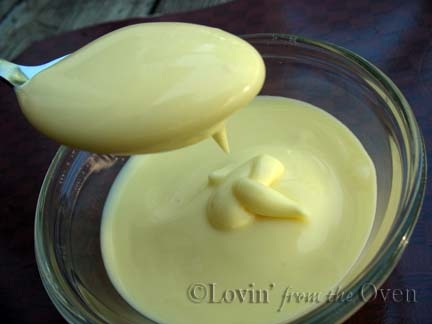 I can just imagine how amazing a potato salad made with this mayo would be!